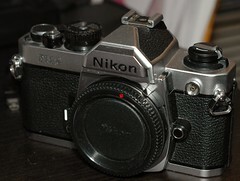 The Nikon FM2 is a manual, mechanical, semi-professional 35mm SLR camera manufactured by Nikon from 1982 through 2001. The FM2n, manufactured from mid-1983 and on. The primary difference between the two was an increase in the Xsync time (from 1/200 to 1/250). Early shutters were made from titanium; however, from 1989, for the FM2n, manufacturing technology had advanced sufficiently to allow for aluminum to be used. The FM2's shutter was completely mechanical yet was capable of speeds from 1s through 1/4000th. This was unheard of at the time it was made. The camera also had an extremely high level of manufacturing quality; this could be felt in the extremely smooth mechanical functionality of the camera, such as the film advance lever. The Nikon FM2 is well known for its durability. In a time where many manufacturers were switching to electronic mechanisms, most devices on the FM2 were built entirely mechanically. Many FM2s remain in service to this day, while many other cameras from that time no longer work. Many parts were designed to be self-lubricating, and so very little, if any, maintenance is required of the owner (other than maintenance one would expect with an SLR of course). The FM2 is not a small camera. In fact, it is very hefty by many standards. However, what you pay for in size you gain in durability. The basic FM2 is extremely resistant to damage, though a model was made by Nikon with a titanium body, the FM2/t. The FM2 is also serviceable in a wide variety of temperatures -- ranging from −40°C to +50°C. The Canadian Government continues to use Nikon FM2 cameras in the Arctic because of this. The FM2 was built to be compatible with the range of Nikon F-mount lenses, introduced in 1959. The FM2 supported the Automatic Indexing (AI) feature introduced in 1977. Unfortunately, although lenses introduced since 2000 (the G series) will fit on the camera, since these lenses do not have aperture rings, they are virtually unusable. The DX lenses, designed specifically for digital cameras, will mount, but the image circle is smaller and thus inadequate for usage with the FM2 or any other 35mm Nikon. The IX Nikkor lenses should not be mounted in the FM2 as they have elements that go further back into the camera body than space is available in the FM2, and thus will cause damage. For its time, the FM2 had many interesting features. For example, the light meter was made using silicon photodiodes, automatic flash control (for certain models), and, the feature for which the FM2 was best known, a completely mechanical shutter control. The FM2 uses two photodiodes for the light meter. The measured exposure level is indicated to the user with a simple vertical +/o/- indicator (3 LEDs) on the right-hand side of the viewfinder. The appropriate LED(s) will light indicating the measured exposure level. The light meter itself is a 60/40 counterweighted meter. To activate the light meter, simply release the film advance and depress the shutter release slightly. The light meter in the FM2 requires two S76 or A76 batteries, or one 1/3N battery to function. The shutter in the FM2, as noted before, is completely mechanical. The shutter was a bit of a design problem on its own. Allegedly Nikon had put together a team of top-notch engineers, designers and technicians to try to design their next generation shutter at a time where 1/1000th was considered a fast shutter speed. The initial goal was not to get a fast top shutter speed, but to create a shutter with a 1/250th sec flash sync speed. After several prototypes a shutter capable of 1/200th sec flash sync and 1/4000th second top speed was developed, demonstrated and released in the FM2. Early FM2's will sync at 1/250th, though, just will have the ready light in the viewfinder flash rapidly. Initially the shutters were made of honeycombed titanium (where the honeycomb pattern was intended to improve durability of the shutter curtain). Later metallurgy improved to a level such that aluminum could be used. The FM2n could be considered an incremental update to the FM2 model. The chief differences are that the Xsync speed was increased to 1/250th of a second and the 1/200th setting was removed. Also, the hotshoe design was changed aesthetically. The mirror box was also redesigned to add a light trap that flipped up when the mirror is flipped down. The X-sync time of an FM2n is 1/250th (as marked on the shutter speed dial). Serial number is higher than 7249xxx for chrome bodies and starts with 73 or higher for black bodies. 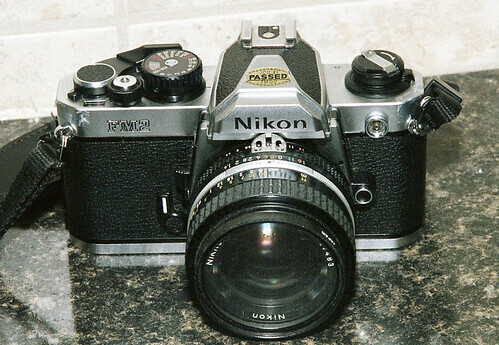 When introduced in 1982, the Nikon FM2 body (no lens) retailed for about $364 in the US. In 1988 the same camera could be purchased for $525. By 1995 the price reached its highest, $745, where it remained until the model was retired in 2001. This page was last edited on 12 January 2018, at 06:25.